A work friend emailed me recently and asked for an update on how to stand-up diaper a boy....so here goes! 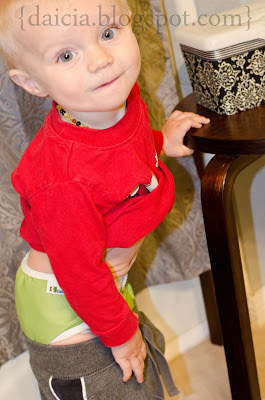 I wrote my past "stand up diapering" post after potty training my daughter . (And THIS ONE while we were still in the process.) We are now on to Little Man and so I wanted to update how the process is going with him. Additionally with Quinn we used disposable diapers. With Beck we are using cloth diapers, so I feel like I'll have a good handle on the learning process through both methods. We started "potty training" Beck from his first days of life. 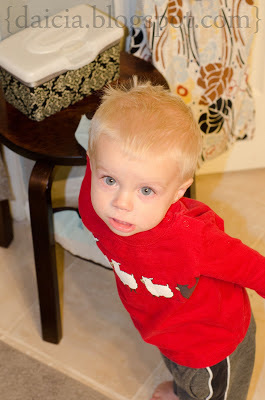 In a developmentally appropriate fashion we began talking to him about the diaper change. "Mommy's going to open your diaper. You have a VERY wet diaper with lots of pee-pee! Let's put this dry diaper on you and that will feel much better." (Imagine that being said in a nice baby-talk voice, of course!) "You are poopy and stinky, Mister! Mommy's going to clean your bottom with this wipe. There, that's better! We'll throw this dirty wipe in the bag and get a nice fresh diaper." STEP 1-Begin by explaining what is being done during diaper changes and giving the child the vocabulary that goes along with diapering. From birth to about 10 months we changed him on a changing table (okay, really the top of my dresser, but close enough). 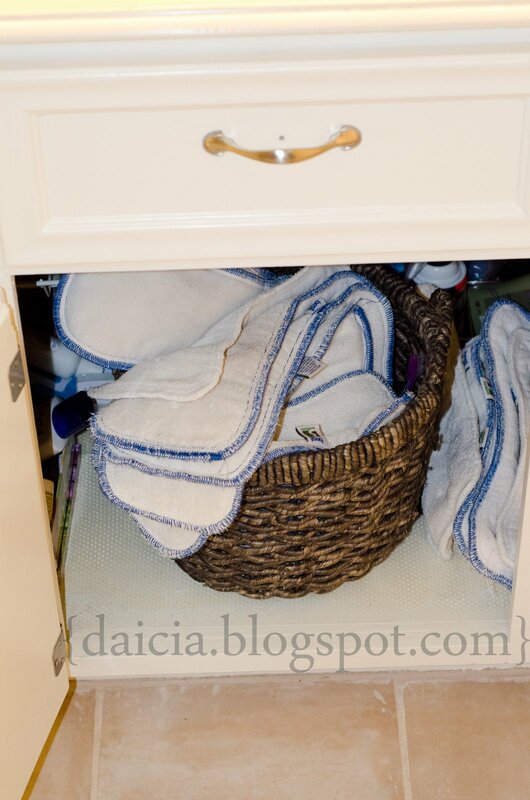 Always using the same spot at home is important to signify "THIS is where diaper changes occur" and to begin to help the child clue in to the schema of diaper changes--location, procedure, vocabulary. While it's a bit more work to change diapers in the same place every time, it is helpful to the infant to understand they'll be having their diaper changed. Eventually around 6 months old my son began to understand what was being done during diaper changes. He'd reach for the velcro tabs on his diaper as soon as we'd remove his clothing. 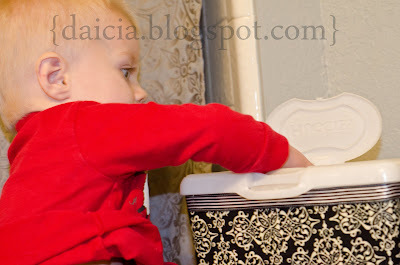 He also liked to help hold items for the diaper change--cream, a wipe, etc. We continued talking with him about the diaper change. STEP 2- Begin including the child in the diapering/toileting process as soon as possible in a way that is developmentally appropriate. Initially this begins with having them hold items used for the change. We keep diapers in the bathroom cabinet in two baskets--one for the fabric inserts and one for the PUL covers. This works for us using cloth diapers. We pile the "overnight doublers" in between the two baskets. 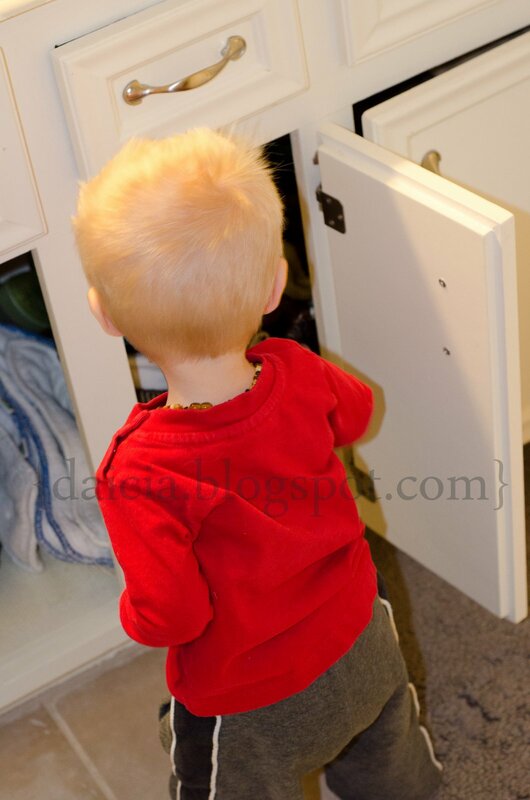 A nice benefit to this is that Beck LOVES opening and shutting cabinets, so you'd better believe he'll take any opportunity he can to open and shut these. 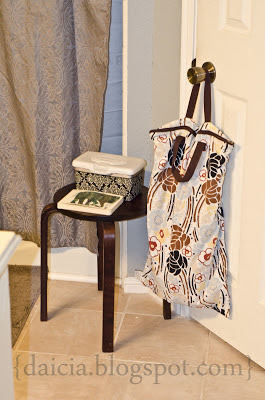 We keep cloth wipes and a wetbag (for dirty diapers/wipes) next to a little stool. I started out placing a small, interesting item on the stool as well, to give Beck something to look at while I changed him (I'll talk more about this later...). With Quinn we used a similar setup, though we kept a wicker basket with extra disposable diapers, walmart bags (for poop diapers), and cream under the stool. Beck's cream is coconut oil in a glass jar, so I keep it out of kiddo reach. The stool is used for Beck to hold onto during changes. At the lab school where I learned to stand up diaper we used a small chair for the teacher to sit in and the child actually supported themself on the teacher's leg. I have also used the toilet when we've been at someone else's bathroom. Usually I just throw a towel over the closed toilet so Beck doesn't germify his hands by touching all over it. If it's just one time I'll be doing it, I often just wash his hands really well after he holds onto the toilet. STEP 3- Once the child is able to support their weight assisted, begin standing diaper changes in the restroom in a "diapering station." Of course the first few times you do this the child wants to sit down, crawl away, etc. Be patient--of course no new task happens automatically the first time. Think of it as a process. Like eating--your child didn't figure out how to eat the first time you approached his mouth with a spoon.....If your child tries to walk/crawl away, gently say, "Stand here for a diaper change!" and help his body back to the stool. You may have to do this repeatedly. It helps initially to put a book or small toy on the stool that the child will want to look at. Continue using the vocabulary and explaining the process as you change the diaper. After a few changes your child will understand what to do. Beck was very interested with the wipes container, so it worked well to let him open and close that as I changed his diaper. wetbag and now he's moved on to wanting to zip/unzip it. He also loves when I put a little dab of diaper cream on his finger and ask him to put it on his bottom. So at a year Beck could--stand for diaper changes, remove his own diaper, clean his body with a wipe and put it in the wetbag. He also waved his hand at any poopy diaper and said, "YUCK!" to which I'd reply "poop goes in the potty" while I dumped it in (off his cloth diaper). Now at 16 months we are on to more tasks! As soon as he figures out the past skill, I know he's ready for another step in the toileting process. 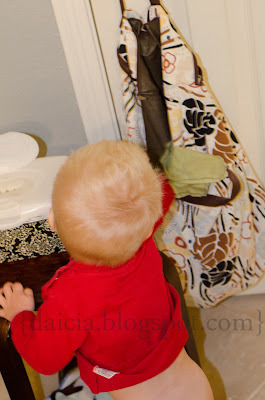 I love stand up diapering because it allows the child to participate in toileting in an active, developmentally appropriate way, instead of being a passive observer just laying there watching me do all the work. This method is also very empowering for the child--they are so proud to be able to complete these tasks on their own! I always do a "shirt roll" before starting the procedure. 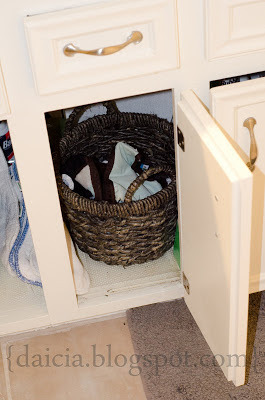 This keeps clothing out of the way and is good to teach them so that when they use the toilet they don't pee on their shirt. Initially I do the rolling, but as they start using the toilet I provide modeling for them to do it themselves. Then he takes off his diaper and hands it to me. With Quinn I had her put it in the trashcan herself. With Beck I need to put the used insert in the wetbag and we toss the cover in the shower to be rinsed in bathwater after the kids bathe. Getting a wipe to "clean his body." Putting his wipe in the wetbag. STEP 4-Include the toilet when applicable. At 16 months Beck has obviously noticed the toilet. He wants to come in and look at it whenever anyone else is using it. He wants to flush it and he wants to play with toilet paper. These are cues he's ready to START learning about the toilet. I choose to use the actual toilets for training. For me this makes more sense than the little potties. I don't want to have to teach the skill once on a little potty and then teach it again when it's time to move to a big potty. Also little potties aren't accessible everywhere. We use a potty seat and a stepstool. Beck loves snapping on the potty seat (Q did, too, at this same age!). Right now I am setting him on the potty. Q totally climbed on like a mountain woman herself at this age, but Beck isn't quite as agile. Typically he just sits for a second-- I am showing him how to tear off a little piece of toilet paper and "clean his body" and then he throws it between his legs into the water. We will refine and expand on these skills over time, but for now he's learning the logistics--and later when he's actually concentrating on the act of peeing, he will already know how to use toilet paper, clean his body, and flush--so he will only have to focus on that one skill--peeing. Additionally whenever we know he's pooping we take him to the toilet and set him on. Often he ends up pooping in the potty. We don't make too big of a deal about it--just say, "Poop goes in the potty!" and he gets to flush it down. He sits on the potty in the morning, before nap, and before evening bath, then anytime we catch him pooping. Again, we don't make a big deal out of any part of it--we just treat it like a normal part of our routine. If he resists, I help him if I can, and if not we just let it go until next time. The Older Infants classroom I worked in at the lab school used this exact same procedure and all of the kids sat on the potty, tore tp, "cleaned" and flushed at each diaper change, then washed their hands, with help (again, don't wash their hands FOR THEM....teach the steps and let them do what they can, expanding as you go!) Very rarely did someone not want to, and if so, it was calmly accepted without making a big deal of it. Beck is currently working on putting his own pants back on--right now I hold them open and he steps into them (instead of me putting his lets in). He's also working on removing his own shoes and socks and rolling down his shirt after a diaper change. When he has a poopy diaper (such as in the morning when he wakes up) I dump it in the potty while he watches, saying "Poop goes in the potty!" and he flushes it. --I've found it works well to turn the diaper inside out before putting it on a standing child. Then I double check all the holes--waist and both legs to make sure the diaper is on straight. If you are nervous about getting the diaper back on, just fasten it however you can quickly and you can always make adjustments afterward. Verbally explain to the child what you are doing! "Mommy needs to tighten up these tabs so your diaper doesn't fall off!" -When wiping poop you can lift first one leg and clean that side, then lift the other and get the rest. -Just like your child....the first few times are going to be awkward, but you'll get the hang of it! Promise! I worked in a school of 40+ teachers and all of us had to learn it--there wasn't anyone who was not able to do it after a week or so. Just be patient and relax! So.....in review.....I Love the stand up diapering/Montessori diaper changing method because it allows toilet training (potty training) to be a process that is refined as a child grows--allowing them to be an active participant in each stage as they are able--and it doesn't require a radical, sudden learning curve where a child is asked to master the entire process in a couple of days. It is slow, it's simple, it's NOT A BIG DEAL, it's routine, and it is pleasant (well, as pleasant as poop can be....). I'll try to remember to stay current with some updates on the process as we continue it with Beck!! Snow nixed, shaving cream sensory play wins!